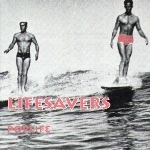 Lifesavers come back with an album that goes in a surf rock direction (more so than than former Lifesaver/Lifesavor albums). The liner notes of this album mentions L.S.U. fans that are scared of this release, and Lifesavers fans that are scared of L.S.U. Re-released in 1999 on M8 records with bonus songs. After surf film legend Bruce Brown passed away in 2017, Michael Knott revealed that he paid $500 to have the cover image of Browns on the this album. Such a cool record. I’ve always loved it, jammed to it, and regard it as a darn good, no-fuss rock ‘n’ roll record.